The future Telco CIO: Serving whom & delivering what? Moving to the top right (to a business laissez faire attitude) would lead to mayhem. There is no doubt that a degree of control is required in this shifting world, but it must not lead to a restricted offering internally or externally. Shaping the network and the IT systems supporting it to reflect the changing world needs a fundamentally different approach from Management. No longer can the telco dictate the types of services or usage patterns that its ultimate customers adopt. Indeed, the necessity to allow for ever-shifting eco systems of partners and channels means that this new ICT infrastructure has got to be manageable to the nth degree on a cost efficient basis. Firstly, is it a CTO or CIO issue? Telcos have traditionally held the CTO role as being above that of the CIO. As we shift towards a software-oriented telco this cannot continue. The interrelationship between all of the IT systems, network operations and ultimate customer service have got to be viewed holistically, hence the CIO takes the upper hand. Or is that true? Given the changing nature of the telco itself and the different Lines Of Business (LOBs) and their relative power, perhaps the CIO ends up subservient to the LOBs and their need to get services more closely matched with their differing customer bases. Secondly, the CIO has a changing set of relationships with suppliers. The all-IP network and the importance of the data centre mean sacrifices have to be made. Fewer suppliers is a goal for most. Turning equipment and software into services to be purchased is a realistic target for the CIO. The emergence of cloud-based offerings mean that the CIO can source building blocks for the network and the IT infrastructure on a much more flexible and cost efficient basis. 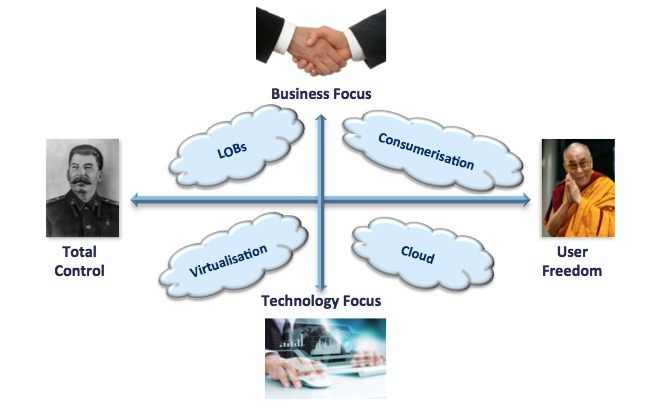 So, what should the CIO concentrate on? The fact of the matter is that everything is tending towards software and a virtual environment. Hence the telco CIO needs a very different set of skills. Should the network engineer-oriented or IT services-oriented C-level be in charge? Probably neither, unless they can truly embrace the shifting demands coming from the business as a whole and the Lines of Business (LOBs).